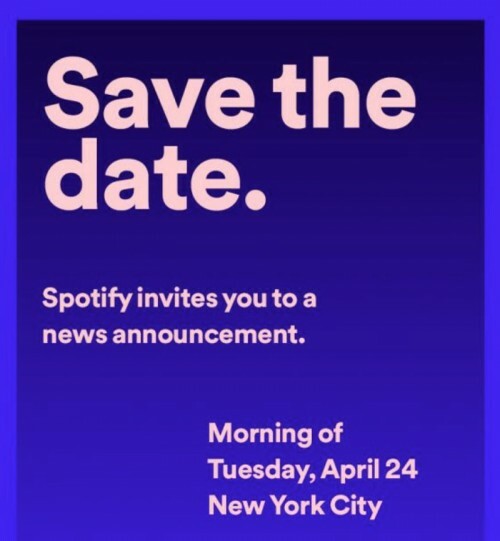 Spotify has sent invitations out to the press for an announcement that’s taking place in New York City. The event invitation only says “Spotify invites you to a news announcement. Morning of Tuesday, April 24 New York City”. The invitation has a gradient blue background, so there isn’t even a hint as to what the “news announcement” is all about. If recent reports are anything to go off of, there are a couple of plausibilities. Not long ago, a small number of users reported a feature that was being tested by Spotify: a voice interface that would make it easier for folks to navigate around the music service’s vast collection. Back in February, the company posted a job listing that explicitly described that the company needed help to set up “manufacturing, supply chain, sales, and marketing” for some kind of tangible hardware product. This leads to a couple of possibilities like a Spotify smart speaker or maybe some kind of in-car voice-activated solution for listening to Spotify. Again, the invite doesn’t hint at hardware. The announcement could even be the launching of some new service or a restructuring of Spotify’s paid tiers. If we went on, we’d just be spit balling even more. What do you think Spotify will announce? piracy is better. we can get anything for freeee.